‘Upton’ is a name derived from Ango-Saxon, meaning ‘the homestead on the hill’. Just as a home is so much more than a house, so a church is so much more than a building. It is full of people and life. It lives on faith in a living God and finds its purpose in following Jesus. A church thrives on the certain knowledge that God lives in us by his Holy Spirit. From the earliest times, faith in Christ had been expressed here in Upton. There is evidence of a church building at Overchurch from about 600 AD. A Runic Stone was discovered at Overchurch dating between 700-900 AD. The stone invited people to ‘pray for Aethelmund’. Prayer is always a vital sign of faith. There followed a Norman church which was damaged by storms and destroyed by a fire in 1813. A small chapel existed on Greenbank for a few years before the accerating growth of population prompted the need for a larger church building. For many centuries, Upton was a traditional Cheshire village of dairy farmers, artisans and labourers. Their lives were dominated through the years by absentee landowners. This changed in 1800 when Upton Hall was rebuilt. Major changes in land ownership from the 1854 resulted in the building of several large mansions for Liverpool ship owners and merchants. The largest, Upton Manor, had a model farm and estate. Its owner, William Inman, a noted Christian philanthropist, transformed the village and its economic life. Having bought the patronage of St Mary’s, Inman appointed a new vicar and was elected as a churchwarden in 1859. The number of Protestants in Upton had been growing steadily and the existing church, at the west end of the village, was not only too small but needed repairing. William Inman became the prime mover and financier in building a new church in 1868, in at the east end of the village on the site of a small farm. This is the present St.Mary’s church. Today, from Ford Road, the church has the same exterior appearance as it had at its consecration apart from the loss of four pinnacles on the original tower, and the addition of a clock with two faces on the tower. However, when viewed from Church Road, the exterior of a major extension added to the north wall, together with a new entrance and link to the church halls, built in 1977. 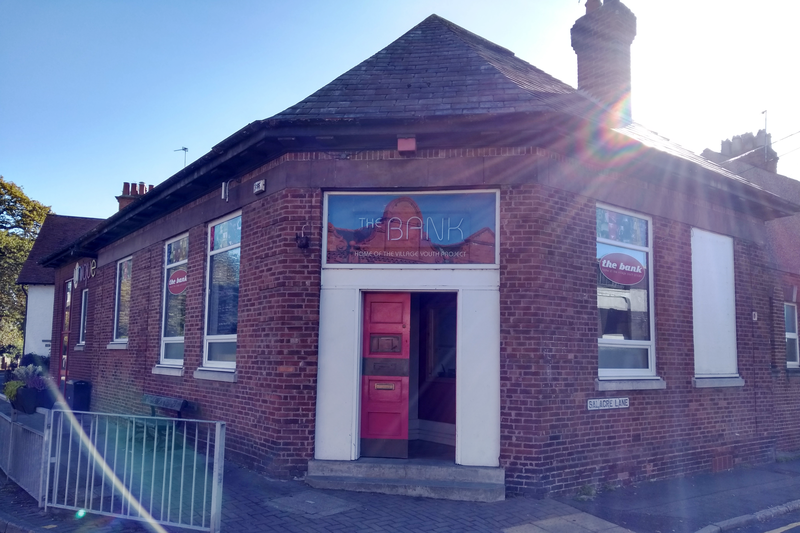 The Centre on Saughall Massie Road was bought in 1975 and transformed into a place for a new congregation to meet. 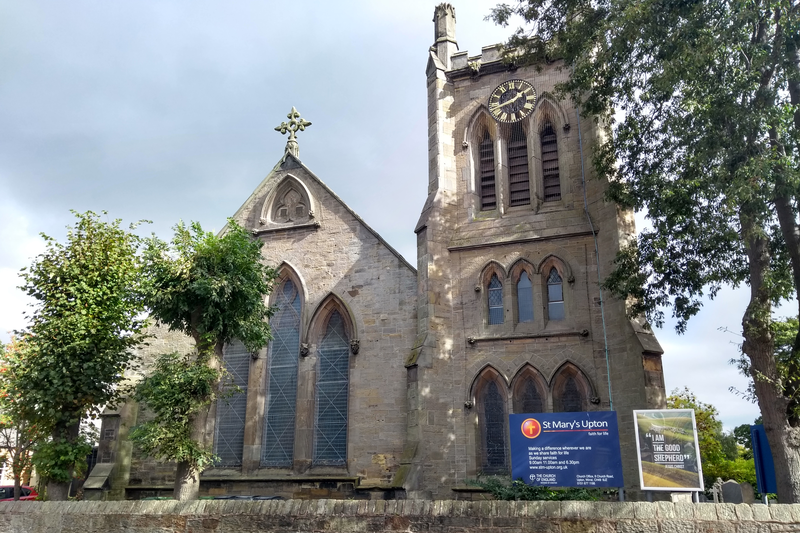 Of particular significance to the development of the work of St Mary’s occurred in 1896 when the patronage was gifted to the Simeon Trust by the widow of William Forbes, a church warden when it was built. The trustees are dedicated to the appointment of incumbents with an evangelical outlook based on biblical teaching and with an interest in Overseas Missions. This has been faithfully undertaken and resulted in the subsequent support of many missions and, during the last thirty years, missionaries in many parts of the world. The church family has grown over the decades, believing that we are called to make a difference wherever we are as we share faith for life in Christ. We pray that many will find a home amongst us. For a full history of the church, contact the church for a copy of Set upon a hill – The story of St.Mary’s Church and Parish, Upton, Wirral by Robert Pullen and Kenneth Burnley. Eaton Press Ltd, Wallasey, Wirral. 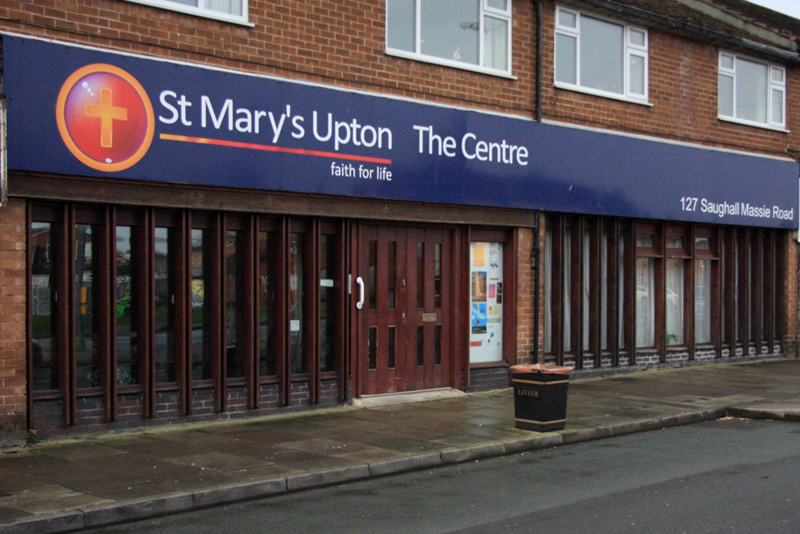 The main St Mary’s building at the junction of Church Road and Ford Road, Upton. 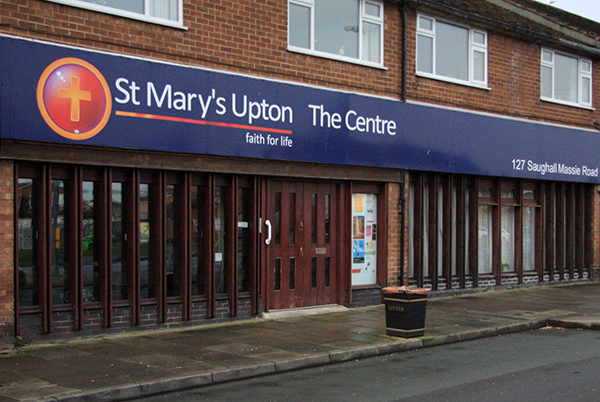 St Mary’s Centre on Saughall Massie Road, Upton.